Research shows that high levels of mental health are associated with increased learning, creativity and productivity, more pro-social behaviour and positive social relationships, and with improved physical health and life expectancy. Positive mental health is about being cognitively, emotionally and socially healthy – the way we think, feel and develop relationships. The average person spends almost half of their time with their mind wandering, usually worrying. In an age where our brains are trained for activity, mindfulness can be a useful tool to train ourselves to go to a place of focus and calm, so we can be more present in our lives. One of the secrets to positive mental health is being able to get back to ‘zero’ as often as possible, in order to clear our heads of negative stress and worry. Even just five to ten minutes of practice can help to bring your attention back to a focal point and to maintain sustained attention for longer periods of time. A quick and easy way to get back to ‘zero’ is through practicing deep breathing. To help employers promote positive mental health in the workplace GB has developed Take Ten for Zen – a simple tool employers can use to run deep breathing sessions in their workplace. Participants are encouraged to take ten deep breaths, in order to “get back to zero” and de-stress. GB’s Take Ten For Zen resource page provides instructional animations employers can use to run Take Ten For Zen sessions in their workplace, as well as facilitator guides and other tools. Take Ten For Zen started life at GB as part of our internal employee wellness programs. 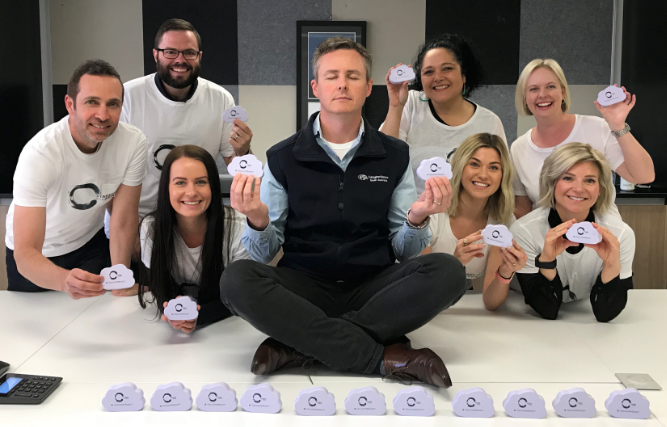 GB’s Diversity Committee launched the #take10forZEN initiative as a way to teach the team a fundamental stress management skill – deep breathing – that can be used anywhere, anytime. At 10 minutes past 10am, on the 10th day of the 10th month, the GB team experienced a sense of collective Zen, through simultaneously taking 10 deep breaths. GB’s Diversity Committee provided kits to Team Managers, to enable them to run the #take10forZEN breathing exercise with their own teams, providing a fantastic opportunity to engage directly with their team members in supporting their mental health and wellbeing. GB posted about the program on social media, and received an overwhelming response from clients wanting to run similar sessions in their workplaces. From that – Take Ten for Zen was born.